We love to read (especially Harry Potter! ), but we know there are plenty of incredible writers in the fandom who are itching to connect with others and share their work. 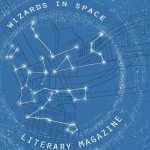 Whether you write poems, creative musings on life and love, create art that tells a story, comics that simultaneously entertain and inspire, or non-fiction pieces on identity, there’s bound to be a space for you at Wizards In Space Literary Magazine. Keep reading for an exclusive interview with the Founder and Editor-In-Chief, Olivia Dolphin, and a special 20% off code for Leaky Cauldron readers! It’s a beautiful introduction, a “sorting-hat song” – as they put it – offering a place to “break when you need to and build what you can”. They are empowering writers to speak their minds freely, without judgement. Every creator has put something of themselves and the communities they have encountered into their work. ‘Full of Grace’ explores notions of the self and identity, and finding one’s self amidst forces of repression. ‘Queer Is’ tells a story of sexuality and body image, and finding ways of self-expression. The issue is not without its magical moments, either! A Small Incident With A Door sees A.J. Brennan answer questions we have about ableism at Hogwarts. Though not officially set at the school itself, the main character, Jill, moves the stairs at their magical school upwards after warning everyone around them, and rejects a flying carpet to get around their need for a walking stick! Then there’s the art, pieces like ‘Personal Space’ by Lucia Ceta give context to the modern-day inescapability of feeling too present, and ‘Disassociate’ by Lily Joiner illustrates inner turmoil in a galactic comic. A piece called ‘Made of Space’ by Tiffany Montes closes the issue, and it perfectly book-ends this broad, time-travelling, border-crossing, convention-defying collection. 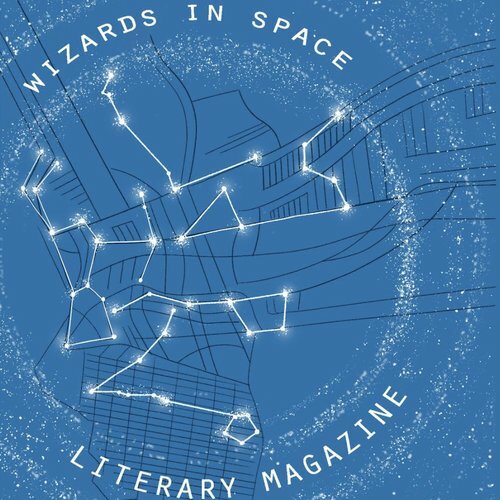 We spoke to Olivia Dolphin, Wizards In Space’s Founder and Editor-In-Chief, about the creation of the magazine, its beginnings in the Potter fandom, the theme of issue four, and some encouragement and advice on writing. Read our interview below! 1) How did Wizards In Space magazine come about? What are your connections to the Potter fandom? Olivia: I’ve been in the Harry Potter fandom for over 15 years. Fansites like Mugglenet and Leaky Cauldron brought me into this world of creative, do-it-yourself fans that figured out how to make the internet a better place for us all to come together and create art around the series we love so much. On top of fan art, fan fiction, fan whatever, there’s so much talent in the community in beyond that I wanted to signal boost! After attending an open mic for attendees at NerdCon: Stories in 2015, the idea of Wizards in Space was solidified in my mind. It was time for original works to have a space to shine in fan communities and beyond. It was important for us to build a space where writers and creators can step out from the shadows. To literally create time for writers to share their work in welcoming, community spaces. We wanted to highlight the work people are doing outside shared conference weekends, or might be too afraid to share without a little bit of a push. Our mission is to create a safe and inclusive space for writers to share their magic in print and IRL. We publish original works (not fan fiction, we’ll get sued, sorry!) We also want to introduce avid readers to young or established writers and artists that they might not have heard about. We publish all genres and types of writings. Because of our wide range of genres and styles, and that we offer payment, we’ve reached a much wider audience than I could have ever imagined. 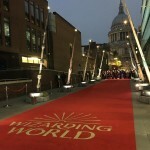 2) So many Potter fans are brilliant writers – there are some great fan fiction communities out there, and such excellent artists and creatives who are making game changing content fuelled by their love of the series and the messages we see in Harry Potter. What do you think it is about this community in particular that makes them such thoughtful and inspiring writers and creators? Olivia: Honestly, it’s the power of critique. Harry Potter taught us to be critical of systems, processes, and to reject the notion of “that’s just the way it’s done.” We look for improvement. We learn from history. We’ve been empowered to strive for better, to imagine better. So we do. 3) I was really moved by how diverse and personal the writing is in Wizards in Space. What are your thoughts on making creative writing more inclusive, and ensuring Wizards in Space is a safe space for people to express themselves? We do a couple things to create a safe publishing space. 1. We pay all writers as mentioned above. 2. We ask for content warnings for pieces that we can include in the book as necessary. You can find those at the beginning of pieces that we feel warrant a CW. 3. We primarily focus on signal boosting voices of underserved writers. We specifically reach out to certain communities in hopes they’ll be interested in submitting! Diversity is about going to the places where those groups are, and asking if they’d like to submit! You can’t wait for diverse groups to find you, that’s not their responsibility. 4. Pieces regarding different cultures/races are sensitivity read by members of that group. We take a lot of care in creating the types of publishing spaces we want to see in the world. In terms of how personal the writing is – that’s on the creative writers themselves. We welcome raw. We welcome hearing the hard stuff, or the stuff that stays with you after you put the book down – the pieces that your mind wanders back to even after more issues have come out. But it’s the bravery of the writers themselves that make it happen, the hard work of processing your thoughts and then building art out it. If we have a small part to play in inspiring writers to do that, then I’m honored, and we will always be honored to be a home for writing that desperately deserves to be read. I want to mention that diversity and inclusivity is a journey, not a destination. There’s always ways to improve. We’re looking at ways to safely create ebooks that protect our product, but also allow disabled readers to enjoy a digital version. We’d also love to be able to create an audio book for folks who prefer it or need it for any reason. While those things are out of our reach right now, they’re very much on our radar and something we’d love to be able to fund one day. 4) What advice can you give to fans who might be finding their voices for the first time? Where do you suggest beginning when looking for inspiration if they’re interested in writing for Wizards in Space? Olivia: Journal. Or have a digital diary. Whatever it takes to write every day you can. Give yourself little challenges. Three line poems. Haikus. Writing prompts. Join a writing group! Get feedback. It’s so scary to have your stuff read for the first time but it can be validating and help you grow at the same time. Also, read a lot. If you want to write creative nonfiction, then find creative nonfiction writers you love and read everything they’ve written. Poetry? Same thing. Immerse yourself in the world. It’s like what we did for Harry Potter. Ok, it might not be as fun learning all the different passwords of the Gryffindor common room used throughout the books and then the differences in the movies, but it’s the same part of your brain. It’s the same approach. Dive in, and find some cool pals to join you along the way. Writing can be work, but if anyone can do it, it’s the people who are reading this site right now. For inspiration, read our past issues! And issue 04! You can buy issues at wizardsinspacemag.com/shop. Actually, because you’re reading this, use the code “LEAKY” at checkout for 20% off your entire order. 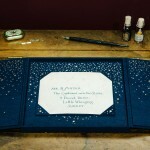 We also have certain pieces available on our blog. 5) How did you settle on the theme for Issue 4? What are some of the pieces you’d like to highlight in this issue? Olivia: In the past, we’ve focused on family and found family, or pieces about finding your identity. The idea of “space and place” felt like the next natural progression. As a fandom and community of readers, we have learned to value the places that leave a mark on our hearts. Whether it was the conference hall from LeakyCon 2016, or the fountain hotel lobby of Prophecy 2007, or that Borders floor where you sat and waited for Deathly Hallows to be released. Maybe it’s the walls of your childhood room where you skyped your Harry Potter friends for the first time. We wanted to highlight that feeling in a curated collection. Asking me to pick a favorite piece is like choosing your favorite Weasley. We love each piece, but if you’re looking for a place to start, here a few. “Across the Hard-Packed Sand” reminds us of the compassion necessary for when someone is in need of a new home through the genre of speculative fiction and is so powerfully written. “Tadpoles” is a nonfiction essay that explores what happens when a home becomes whatever the opposite of home is. Poems like “Yabucoa, Puerto Rico ” and “we will not burn any longer” are all about reclamation of the spaces you love most, and fighting back when it is needed. If you’d like to read Issue 4 (or any previous issues – except Issue 1, which is sold out! ), the team at Wizards In Space are offering 20% off issues for Leaky Cauldron readers with the code LEAKY at checkout! Thanks, Wizards in Space team!